After writing an article on cooking food in your dishwasher, I started to think about other unusual ways to cook. Of course there are your stove, toaster oven, and microwave, but beyond them? Here is my top 10 list. Make soup in a super high powered mixer (video). These machines are so powerful that you can make soup in the blender. Make a grilled cheese sandwich by covering in foil and then placing a hot iron on top of it. Make sure the sandwich is fully enclosed in the foil or you will have a mess. manifold. Again, make sure the food is enclosed to prevent a mess. I’m not sure about the fumes on this one though. Use your blow dryer to heat up a hot dog encased in foil. Make a solar oven and cook anything from stew to beef jerky. Using a black pot will increase the heat and reduce the amount of time needed to cook the food. There are many places that will sell you a solar oven, too. Cook corn in a cooler. Get a cooler large enough to comfortably hold the amount of shucked corn you are going to make. Cover the corn with boiling water. Close lid. Open 30 minutes later to perfectly cooked corn. You can keep the corn in the water for a couple of hours and it will still be excellent for eating. Make a flower pot grill. Half fill an ordinary clay pot with sand and then add pre-lit coals. Grill kabobs. 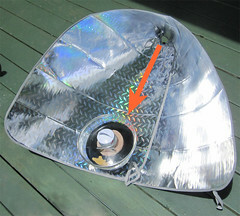 Make a solar funnel cooker from a car sun shade. See picture. Cook over an open fire. This can be a regular camp fire or your fireplace. Eat raw foods. They don’t need to be cooked. While researching this list, I realized that I have become complacent about my alternative cooking abilities and will be practicing more of the above ways to cook. My next adventure is going to be making beef jerky in my solar oven. It is just ridiculously expensive to buy and is full of awful preservatives, so I want to make it myself. Has anyone tried making solar jerky? Got a suggestion for me? @stephanie My grandmother had a dehydrator to make dried fruit and she gave it to my mom, but as a kid we never used it. Now, I eat a ton of dried fruit and would be curious to try this at home. Can you email me more about how you use your dehydrator, any recipes you have, and your good and bad experiences? I’m at julia at bargain babe dot com. Thanks! I agree with Stephanie. I, personally, like the adjustable temps. option on one of my two dehydrators. It makes a real difference with some things. Fresh, dried food and preservative free! I also own a Vita-mix (high-speed blender). They truly are all they say they are. I make spaghetti sauce without peeling anything. Talk about healthy(and fast!!!!!). And, yes, it does make soup. And ice cream! It also makes unbelievable smoothies. 😉 If you want one, look for a “scratch and dent” sale. Got mine for under half price and have just used the hound out of it. The only thing I make in a regular blender is mayonnaise. Thanks for the great site and Happy cooking! @Brooke Hope you got my email. I don’t think we’ve published a cheesy onion soup recipe. I searched the archives for “onion soup” and nothing came up. Sorry!